Here's just a progress shot of my new painting. 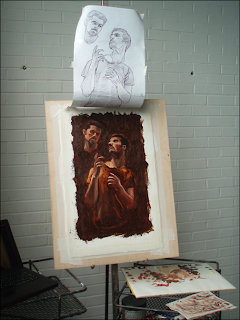 I've only got the underpainting and one layer of the skin down, but so far so good. The background is gonna be a medium-light olive at the top with a transition into a dark bottom. I haven't decided yet if I want the torso to be obviously detached from the legs or if I should fade it into the dark as well. That'll probably be the last thing part I work on. I'm hoping to get this finished midweek next week so I can fit more than one other painting in, but we'll see.